A POIGNANT tale about a young boy receiving treatment for leukaemia has won a prize for a Barnsbury Primary School pupil. 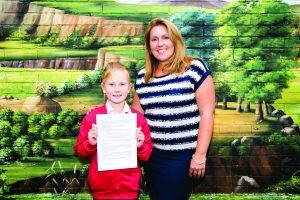 Jasmine Christmas’s story is the regional winner in the 2018 National Young Writers’ Awards. Her entry, called Please Donate, was chosen for top spot by best-selling children’s author David Walliams, who judged thousands of entries from around the UK.